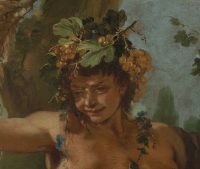 Bacchus and Ariadne (1743/1745), a monumental oil-on-canvas painting by Giovanni Battista Tiepolo, is back on display at Washington’s National Gallery of Art after a four-year conservation. 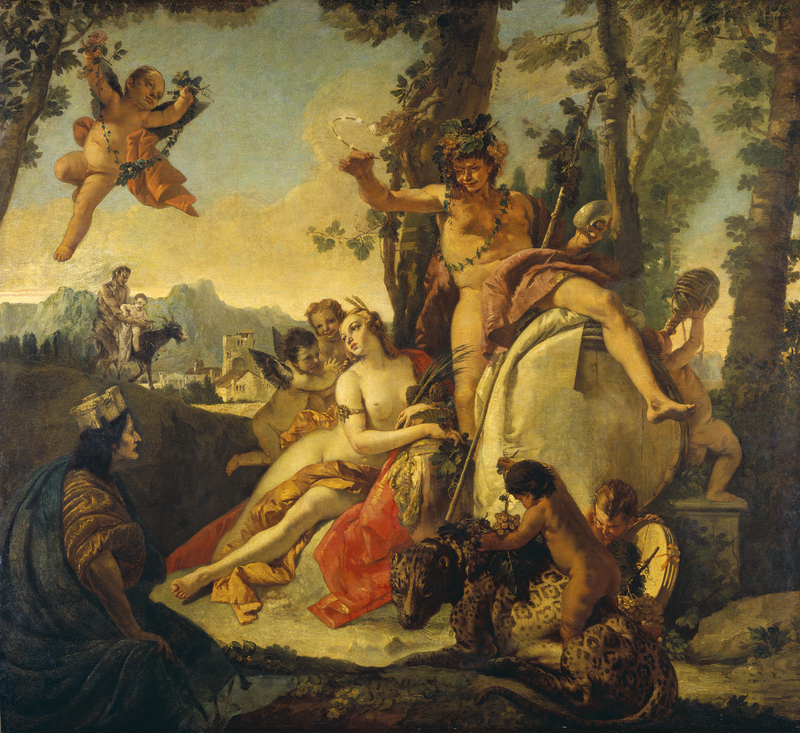 The painting is believed to be part of a series of mythological scenes representing the four elements: earth, water, air and fire, only three of which are known to survive today. Bacchus and Ariadne represented earth. We know from a letter Tieopolo wrote in 1764 that he painted the series to adorn a Venice palace. We don’t know which palace as the only reference in the letter to the owner are the initials “V.E.” Bacchus and Ariadne only decorated V.E.’s palace for 60 years or so before it was bought by a collector and moved out of Venice for good. The meticulous restoration has revealed long-lost original details that were painted over when the work was first moved at the end of the 18th century or lost as the condition deteriorated over time. One characteristic feature of Tieopolo’s mature works that has been brought back to life with this restoration is the coolness of his color palette. This set him apart from other Venetian painters of his period and allowed his frescoes and large-scale paintings like this one to convey a realistic sense of daylight. The illumination effect would have been a particularly desirable feature in monumental works intended to decorate the walls of large palaces. 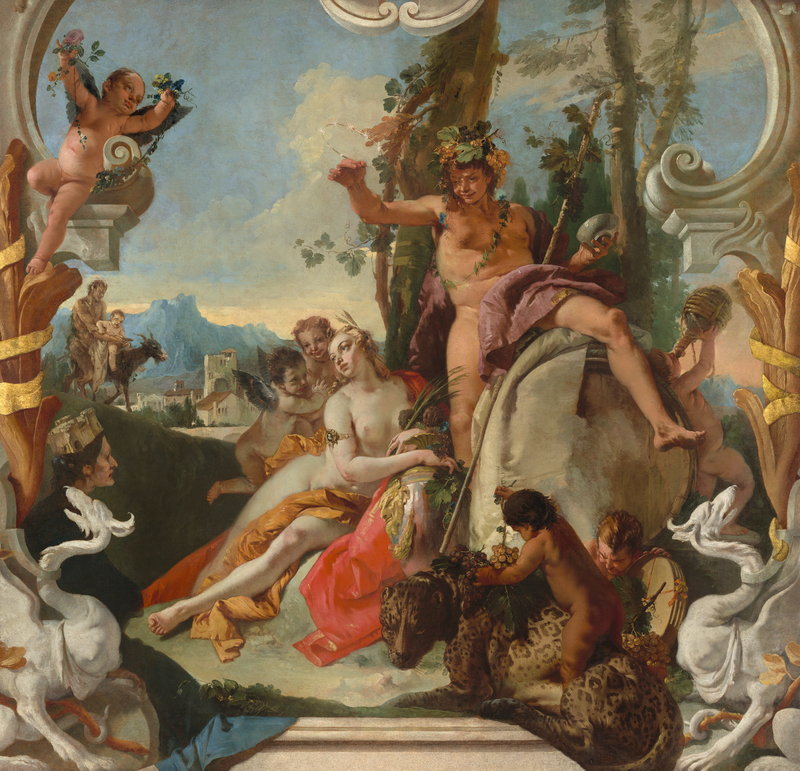 Bacchus and Ariadne, for example, were commissioned to hang over a staircase. X-rays have found that there was a ledge painted along the bottom edge with griffin-like creatures at each end of the ledge. A cornice framed the top of the painting as well, curving down. The right side had a column with a vine of acanthus leaves wrapped around it. These architectural features are thought to have been created to match the location where the painting was originally located. They were painted over, likely after the work was acquired by the Artaria family who hung it in their Como estate. Inventory records note its presence there in 1798. The ledge, columns and griffins were painted out and a figure of Rhea was added to the lower left of the composition. The conservation restored the architectural elements, doubtless much to the relief of the putto on the top left who now has his perch back instead of floating unmoored. 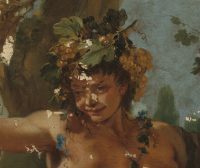 The X-rays also found a great deal of damage to the canvas itself — tears, holes — and areas of inpainting and overpainting from later interventions that were not well done to begin with and had discolored and flaked over the years. The varnish was even worse. Darkened and discolored, the varnish layers had mutated the cool daylight palette of the original to a bilious jaundice. A full relining of the canvas and careful thinning of the varnish layers performed in 1960 was unable to solve the problem, but conservation technology has changed enormously over the past 60 years. The recent treatment has brought back Tieopolo’s light blue sky.